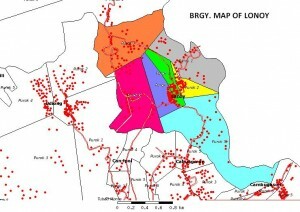 The present official name of the barangay is Lonoy. The past and popular name is Lonoy. According to the old folks, there are 5 (five) natural springs which are good sources for drinking water that surround the barrio proper. Due to the abundant supply of water that means “galanay or galonoy” in the dialect, the barrio was named Lonoy. Long before the coming of the Spaniards, the barrio had already been recognized. According to the old people, this barrio must have been established in 1515. The original settlers came from Duero, a neighboring town and Jagna. They came to the barrio one after another. This barrio include 5 (five) sitios namely, Cabao-asan, Elithon, Canbungol, Cansuhay and Revilles. The soil of these sitios is fertile which attracted the first settlers. Lonoy shall be an ideal place to live in with abundant production of agricultural and commercial product by healthy, strong, happy and upright Lonoyanon, using us much as much as possible its natural resources in the most appropriate manner with the aid of suitable facilities. Lonoy shall be provided with the necessary facilities and accessibilities for comfortable production and development of the Lonoyanons, physically, mentally and spiritually with environment friendly technology, socially responsive ways and above all God-centered manners.